K&N gives you the power you've been looking for with the new XStreamÂ® Air Flow Top. Not only does the XStreamÂ® add filter area, it actually redirects airflow inside the filter to pull in more air through the side pleats for even greater performance efficiency. Cleanable and reusable, the XStreamÂ® Air Flow Top filter delivers the best protection available for your engine.1-1/4" Drop Base. 5-1/8" flange fits all popular 4 barrel carburetors. Total height 2-3/4". 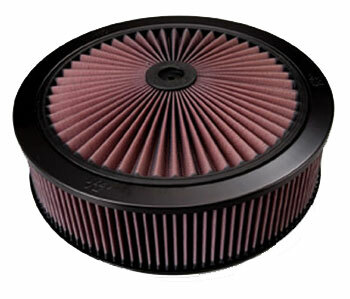 Includes E-1650 14" x 3" filter element.